A discolored and stained smile can diminish one’s confidence. Take-home whitening trays, provided by Fresno dentist, Dr. Jack Oberti, allows patients the convenience of attaining whiter smiles at home. We take the time to prepare you for the treatment, ensuring your comfort during the bleaching process.For custom teeth whitening treatment, contact our Fresno practice today. Why Whiten Your Smile Professionally? As time passes, our teeth become stained and worn. This results in a sheen and shade of enamel that is no longer white. Habits such as using tobacco products and not brushing and flossing your teeth twice daily lead to discolored teeth. Drinking dark-colored liquids such as coffee, dark sodas, tea, and red wine will also stain your teeth. Over-the-counter products can provide some lifting of these stains, but professional treatments allow for a dentist to supervise whitening treatment with high-quality products. Utilizing certain kinds of toothpaste, strips, and mouthwashes that include whitening agents that can be added in your at-home care to maintain a lighter appearance as you receive professional treatment. Dr. Jack Oberti provides custom trays for teeth whitening in Fresno. 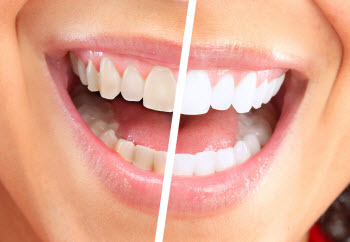 Whether you’re looking to whiten your smile before adding aesthetic restorations or veneers, or just want a brighter smile, teeth whitening treatment with at-home trays can help you attain that. Before treatment, we prepare you for the bleaching agent with a cleaning to remove external stains from your enamel. To enhance your comfort, we recommend an amount of bleaching agent in each product based on your sensitivity level. Before administering teeth whitening kits, we prescribe fluoride toothpaste to strengthen your tolerance. We ask patients to brush twice daily with this toothpaste for two to three weeks before receiving the final treatment. Once you’ve completed this pre-whitening regimen, we create your custom trays. Unlike whitening trays you can find over-the-counter, these trays allow the bleaching agent to apply to all surfaces of your teeth. Depending on the shade of white you’d like to achieve determines the number of times you apply the agent at home. To make sure you achieve the smile you desire, allow Dr. Jack Oberti to provide trusted whitening products to help you achieve a brighter smile. For patients looking to lift years of discoloration and staining, teeth whitening in Fresno removes those intrinsic stains with ease. Contact our dental practice to ask about custom, take-home teeth whitening products. Schedule a consultation today!